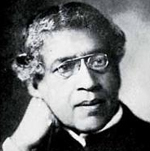 Jagadish Chandra Bose was one of the pioneers of modern science in India. His research was on the properties of electro-magnetic waves. His major achievement was to demonstrate the similarity of responses to stimulation among the living and the nonliving as well as the fundamental similarity of responses in plant and animal tissues. The British Government knighted him in 1917. He founded the 'Bose Research Institute' in Kolkatta in 1917. Bose was not only a biologist, but also a physicist. Bose believed that by focusing on the boundaries between different physical and biological sciences, he would be able to demonstrate the underlying unity of all things. Bose's biological researches were founded initially by the discovery that an electric receiver seems to show science of fatigue after continued use. He can rightly be called the inventor of wireless telegraphy. Bose was the first in the world to fabricate and demonstrate in public (1985) the device that generated microwaves-radio waves of very short wave length. But his invention was not patented before Guglielmo Marconi (1896) who became internationally recognised as the inventor. After completing his studies in London, Bose return to Kolkatta and was appointed Professor at Presidency College in Kolkatta. Then he became the director of the institute he founded and remained in the post till his death on 23rd November 1937.